With hearts full of gratitude, we say goodbye to another year and anticipate 2015 with hope and discernment. Please enjoy this review, written by the members of our core community here in Three Rivers. Thank you for the many ways you’ve supported *culture is not optional in the past year! Our work is sustained by generous donations of all kinds and we thankfully receive your gifts of time, money, prayer and encouragement. Please be in touch about how you’d like to be involved in the coming year, and if you’d like to make a financial contribution, you can do so here. Peace be with you in the coming year! The Rectory, *cino’s community house, was full of good food and laughter in 2014. Jay, Liesje and Deborah endured an exceptionally snowy, cold winter, looking forward to summer when four amazing interns joined the household: Seth, Alexandra, Kate and Nate. They were a wonderful addition to our group, bringing many gifts to the work of a prosperous community garden, exciting and creative Community Fun Nights, a glowing Future Festival and lovely Friday night potlucks. In addition, we hosted visitors from Project Neighborhood, a Calvin College spring break group and a service group from Palmerston, Ontario, who all helped out at the Huss Project and explored the Three Rivers community. 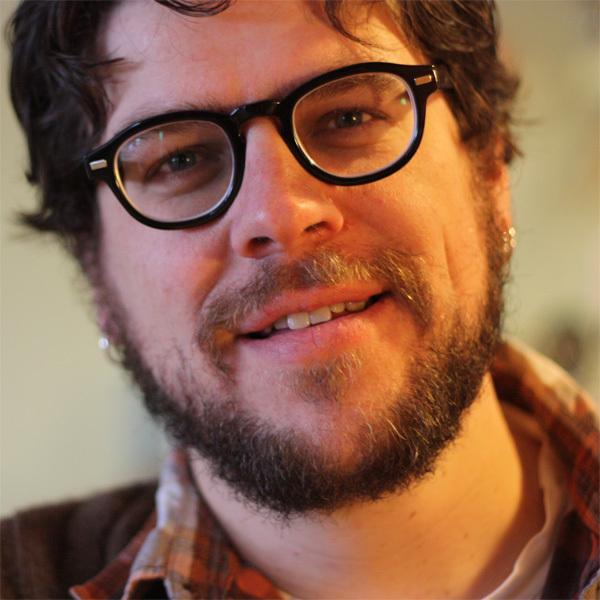 Now as we make our way toward the end of the year, the Rectory will be losing one its inhabitants as Jay is heads to Grand Rapids to pursue new adventures. Deborah and Liesje, along with Rob, Kirstin, Julie and David, continue to gather regularly as a core group, sharing and discerning the focus of our work for the coming year. Preparing and eating food and telling stories has become central to what *cino does. This year we hosted Underground Supper Clubs on monastery grounds at St. Gregory’s Abbey and in the heart of downtown Three Rivers in one of the beautiful storefronts along Main Street. We told stories about our origins, local haunts, our favorite books, and about our love of food during storytelling events at the Huss Project. We want everyone to experience these sacred acts as fully as we do, something that has become clearer to us over the past year. There are stories in food, and stories in turn are food for the soul. It is our hope in 2015 to make more stories and to find more amazing ways to serve excellent food to the people who love it. Once again in 2014, Huss served as a site for a summer lunch program in partnership with Three Rivers Community Schools. School-aged kids in our neighborhood enjoyed over 700 lunches throughout the summer, gathered around the new picnic tables we built in June. In addition, the Huss Project hosted weekly Community Fun Nights where friends of *cino gathered for baked goods, garden goodies, games and crafts. 40-60 kids, parents and other neighbors attended each week—more than ever before! *cino invested in flag football gear, which was put to good use every week as we worked together with our young neighbors on building respectful relationships. We cranked up our jammin’ play list and ran around with kids and had conversations with adults and basked in the sun and learned a little bit more about one another. 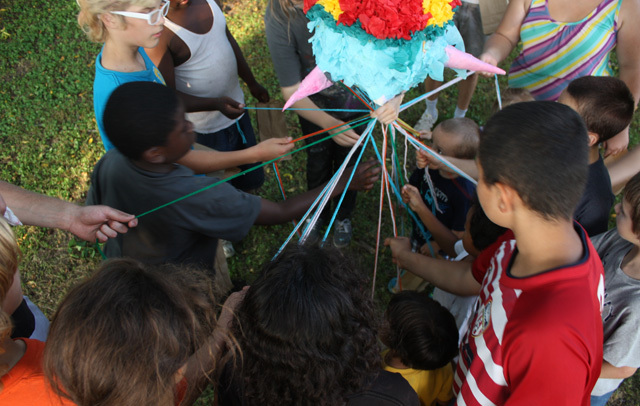 On the final fun night, all the kids gathered around and held a string attached to a homemade piñata, then collectively pulled their strings to break it open. The most popular piñata find: bouncy balls! Community Fun Night and summer lunches help us to stay connected to the neighborhood, and our neighbors. A big thank you to everyone who participated! The fifth annual Huss Future Fest on July 19 was a day full of activities that brought in over 600 visitors, community partners and volunteers — that’s nearly double the attendance in 2013 and it’s encouraging to see the festival grow as a fun, creative and safe place for neighbors to gather. Future Fest is the pinnacle of our summer for *cino staff, interns and volunteers who put in countless hours full of blood, sweat and, yes, even sometimes tears to clean, plan, paint, fold, mow, imagine, and clean some more. A highlight this year was partnering with TRAFC (Three Rivers Area Faith Community) to host their annual Back-to-School Celebration. We saw lots of families coming to the festival to join in the fun and get backpacks full of school supplies. In addition, volunteers from the Huss Project’s community garden sold quinoa salad and grilled veggies and brats, while the locally-famous Weenie King added his hotdog stand to our food options. This year we hosted our second Coin Carnival partnering with local organizations: Three Rivers Public Library, Red Cross, Save the Frogs, River Country Resilience Circle, Congo Cloth Connection/Florence Church, St. Joseph County Department of Human Services, Pregnancy Helpline, St. Joseph County ISD/Great Start, Animal Rescue Fund and Flowerfield Enterprises. Many local farmers also donated generous amounts of produce for our mini farmers market: Triple Ripple Community Garden, White Yarrow Farm, Bair Lane Farm, Corey Lake Orchard and Butternut Sustainable Farm. Dozens of volunteers also helped coordinate many activities for kids, a rummage sale, art vendors, workshops, art installations, a bake sale and live music. It was a joy to witness such incredible collaboration, which is a primary value we hope to cultivate at the Huss property. At the end of the festival, our *cino community, friends and festival attendees took the opportunity to celebrate in gratitude for the Huss Project’s fifth anniversary with a five-song dance party! Working alongside our neighbors, we continued to produce food at the Huss Project this year in our wild and wooly community garden. In June, we hosted a compost tea workshop where several of us learned how to create organic, nutrient-rich fertilizer for our gardens. Even as we struggled with a streak of vandalism, we distributed the garden produce to individuals and families in need through several agencies in our county. Beyond just our own garden, *cino helped publish a local food and recycling guide for our region. We also partnered with several local farms this summer to sell their produce alongside our own at the Three Rivers Farmers Market. After the market closed for the season, we gathered additional farm partners and opened the Downtown Harvest Market in a downtown storefront on Saturdays in September and October. Through these efforts, we shared and sold fresh, local food to a wide variety of people in our community, raising over $3,300 for continued food production at the Huss Project in the future. The question has come up with increasing frequency: what happened to catapult? With many changes in the lives of *cino community members over the past year, 2014 seemed like a good time to pause for a little while and re-imagine the function, look and structure of this longstanding online publication. We initiated a survey that gleaned rich feedback from both new and veteran readers and contributors and we look forward to digging into those ideas in 2015 to see what seeds show promise of germination in the spring. In the meantime, the daily asterisk has continued to be a provocative resource, drawing from many voices past and present, who speak insightfully to the pressing issues of our time with celebration and lament, encouragement and repentance, joy and critique. If you’re not receiving the daily asterisk already, you can sign up for the e-mail list here and dig into the archives here. For all of the hustle and bustle of the year, the *cino staff also made concerted efforts to sit, read, discuss, and dream. We gathered each week over the summer with interns to explore *cino’s core values, and that conversation has continued this fall and winter with a discussion of Peter Block’s book Community: The Structure of Belonging. At the staff retreat this fall, we reflected on 2014, discussing *cino’s successes and shortcomings, evaluating roles and duties in light of staffing changes, and brainstorming where to focus our energy in 2015 and beyond — all while sharing delicious food and enjoying each others’ company!